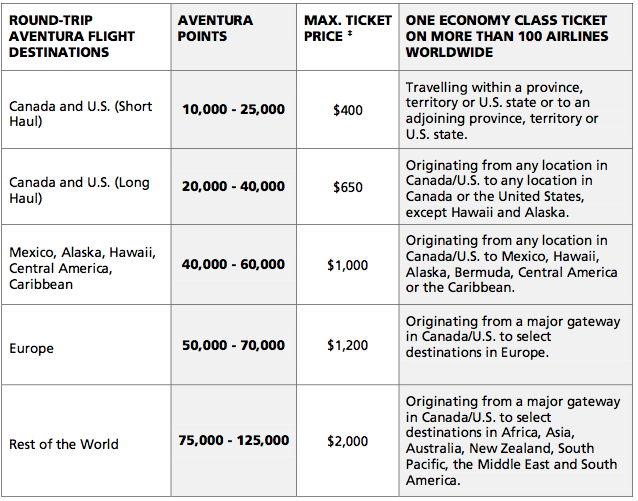 Rewards Canada: CIBC updates the Aventura program - better redemption rates, limited time increased card sign up bonus and more! CIBC updates the Aventura program - better redemption rates, limited time increased card sign up bonus and more! 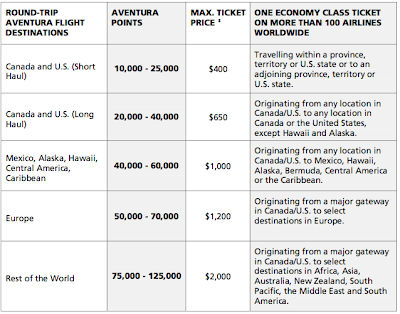 - More airlines available via that reward chart. Previously it was around 100 airlines but now it is being market as any airline, any flight, any seat etc. As you can see the new chart is much more rewarding on the lower end (short haul and long haul flights in Canada and the U.S.) with the Long Haul portion maxing out at 35,000 points for tickets up to $800 before taxes and fees. This is the redemption that offers the 2.28% rate of return. Of course if availability can be met you can get a 4% return on your short haul redemptions but that is a big if. Taxes and fees can also be paid for with points and exactly like the RBC Avion reward chart will cost you 100 points per dollar so only a 1% return. This is where cards like the American Express Gold Rewards Card, BMO Rewards World Elite, TD Visas and Diners Club Club Rewards cards are stronger as the rate of return is not diminished on the taxes and fees portion. That's about it for the new Aventura program! The changes are definitely positive and chances are it will help keep some customers with CIBC instead of them moving to TD. We'd love to hear your thoughts on the changes! Leave us a comment below. I assume the Aventura card is losing the 1:1 transfer to Aeroplan as of Dec 31? There is no mention of it in the new marketing materials so I as well would have to assume that is the case. The 10,000 point level for short haul flights could make this card very attractive. Yes it sure could! Of course it is all dependent on how many tickets they actually have available at that level. the aeroplanPlus gold card is a great card, you can get 30000 bonus aeroplan miles by the link below.